Columban Interreligious Dialogue » Aasia Bibi – Free at last! Aasia is from Ittanwali village in Sheikhupiura district, about 40 miles SE of Lahore and worked as a farm labourer. On June 14, 2009, she was working in the fields picking fruit with other women, mostly Muslim; in the scorching heat the exhausted women took a break and Aasia was asked to fetch water from the nearby well. On her way back, she took a sip of the water before handing it to her Muslim co-workers. They were furious. Many conservative Muslims don’t like to eat or drink with non-Muslims believing they are impure. They told her that she was “dirty” and not worthy of drinking from the same cup as them. An argument erupted and fierce words were exchanged on both sides. Five days later, the police barged their way into Aasia’s house and accused her of insulting the Prophet Muhammad. Outside was a mob, including the village cleric who had accused her of blasphemy. Asia was dragged outside. The mob brazenly began to beat her, right in front of the police. She was arrested and charged with blasphemy; the allegation being that she made three “defamatory and sarcastic” statements about the Prophet. A trial court case was held in November 2010, with the prosecution presenting seven witnesses to support the allegations of blasphemy against Asia Bibi. She was convicted and sentenced to death. The Lahore High Court (LHC) upheld her conviction and confirmed her death sentence in October 2014. Serious concerns about those decisions were consistently highlighted: – both courts disregarded discrepancies in the accounts of the witnesses; neither court considered which of the three statements attributed to Asia Bibi were “blasphemous”; both courts did not consider whether Aasia Bibi possessed the requisite criminal intent to commit the crime of blasphemy, despite the Federal Shariat Court’s ruling that blasphemy is an “intentional or reckless wrong”. Aasia’s legal team appealed this decision to the Supreme Court, which stayed her execution in July 2015 and admitted her appeal for hearing. The appeal was about to be heard in October 2016, but had to be adjourned without hearing after one of the judges recused himself from the SC bench. However, within hours of the verdict being announced demonstrators took to the streets all over the country, organised by a new far-right Islamist party, Tehreek-e-Labbaik (TLP), headed by Khaddim Hussain Rizvi and dedicated to killing blasphemers, demanding one thing – that Aasia Bibi be put to death. The country was effectively brought to a standstill and after three days of escalating chaos, the government effectively caved in, saying that in order to avoid any bloodshed they would strike a deal with those leading the revolt. They agreed not to oppose a court petition to reverse Asia’s release, and barred her from leaving the country. The petition was filed, the mob dispersed, and Aasia was freed from prison, but was taken into protective custody. To the credit of the Government, after the situation had quietened a few weeks later at the end of November, they launched a massive crackdown against the TLP and other extremist groups, arresting hundreds of the leaders. This was crucial for the Government to claim back its authority and to date seems to be holding well. When that petition was rejected on January 29, 2019, and Aasia was finally free, there was no hint of any of the protests seen just three months previously; the Government clearly has the upper hand for now. Aasia wasn’t the only victim in this tragic case; two prominent politicians were murdered for openly sympathising with Aasia and publicly advocating the blasphemy laws be revised. 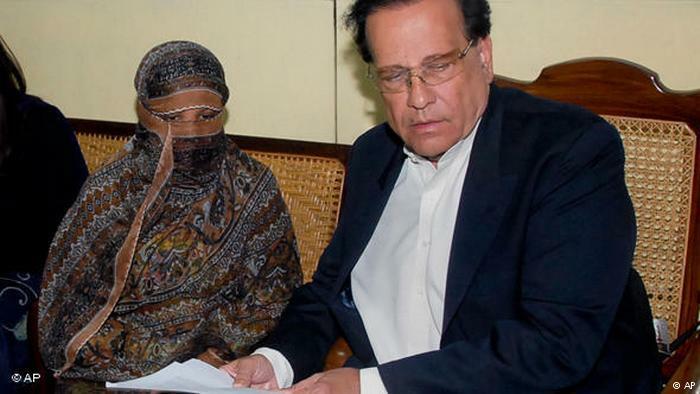 Salman Taseer, Governor of Punjab province, visited Aasia Bibi at Sheikhupura prison in 2010. In a televised press conference, with Aasia sitting veiled beside him, Taseer had appealed to the president of Pakistan to pardon her. On 4 January 2011, Taseer was assassinated in broad daylight by his own security guard, Malik Mumtaz Hussain Qadri, who shot the governor 27 times at point-blank range. Overnight Qadri became a hero to millions. He was sentenced to death, and executed in 2016. On March 3, 2011, the Minister for Minority Affairs since 2008 and only Christian in the cabinet, Shahbaz Bhatti, was assassinated in Islamabad. The Tehrik-i-Taliban Pakistan (TTP) claimed responsibility for his killing and called him a blasphemer of Muhammad. Because of his support of Aasia Bibi and also critizing the blasphemy laws, he had been receiving death threats since 2009. The background to this case and indeed much more suffering over the last four decades in particular, is the shocking misuse of the so-called ‘blasphemy laws’. There is no law against ‘blasphemy’ as such. In the 1860 Indian Penal Code Articles 295 & 298 were inserted and did not refer to any one faith. In 1927, the clause 295-A was added with a two-year jail sentence for causing offense to religious feeling. Since 1986, while nobody has been executed under those amendments, according to Pakistan’s Center for Social Justice, 1,549 cases have been registered (all cases are either blasphemy against the Prophet or desecration of the Holy Koran). In those cases, 75 accused people have been murdered before their trials by mobs and some were even killed in police custody. Therein, lies the heart of the problem – the genie of an extremist vision of Islam is out of the bottle, accompanied by hyper emotionalism and mob justice, with no seeming consequences for the perpetrators in the eyes of the law. This has and is causing endless suffering and death and spreads fear like a virus contaminating countless thousands of people. Aasia Bibi is finally free after almost 10 years of living hell, but she is not safe; she and her family will almost certainly have to spend the rest of their lives outside of Pakistan. But, she is at least free now. Could this case somehow help to bring about a change to the horrendous abuses unleashed in the name the ‘blasphemy laws’; we can only hope so.